Spring is officially here! As the weather starts to warm up and the world comes back to life your restless kiddos are probably ready to get back to playing outside until the sun goes down. In honor of the beginning of spring, we have a few fun activities for outside and inside to get you and your family ready for the spring sunshine! Get Creative! – Crafts are a great activity that will have your little ones excited for spring even while sitting at the kitchen table! Crafts are not only fun but can help your little ones’ cognitive development. Check out Easy Peasy and Fun for a great list of fun ideas! Go Outside! – Today is National Take a Walk in a Park Day! So what better way to enjoy the beautiful weather and shake off the winter cold than to go for a walk in the park! Mommy Poppins has a list of some of the most exciting playgrounds in the state! Or check out Visit NJ for a list of some of the amazing national and state parks we have right here in New Jersey! Get Cooking! – Another great activity is to make some spring themed food! Parade has a great list of spring themed foods and snacks that are not only fun to make and eat, but also delicious and nutritious! Maybe you can make a few of these treats and take the family out for a picnic! Celebrate Nature! – Today we celebrate Earth Hour from 8:30 – 9:30 pm where we can set down our electronics and really connect with nature! Maybe celebrate by reading a book by candle light or relaxing in your backyard. If 8:30 is a little too late for you and your little ones, try finding a different time today to feel connected to nature! We hope you spend this lovely spring day enjoying time with your family whether it’s in the kitchen or walking through a state park! 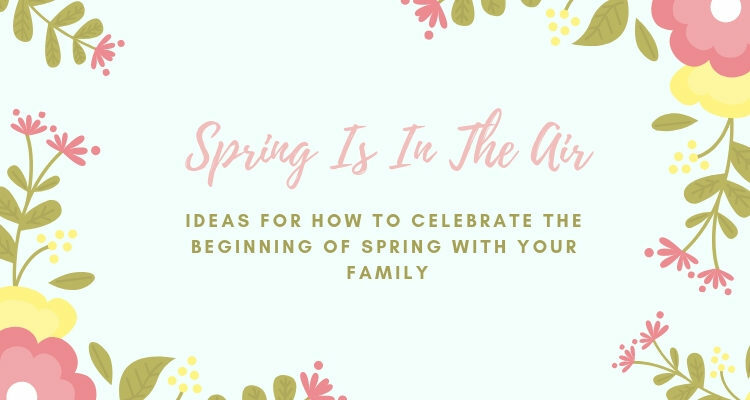 As always, click share on the side of the blog to tell your friends and family about these fun spring activities and let us know in the comments which ones you gave a try today!